Crude oil and gold continued to attract much of the investor focus on the commodities market during the week. Just days before US sanctions on Iranian crude oil are enforced, the oil market is watching Saudi Arabia respond to the situation. Global stock sell-off has kept gold in the limelight in light of demand for safe havens. But it remains to be seen how much profit the yellow metal can see in this round. Crude oil prices continued to be impacted by news from Iran and the weakness of global equity markets. After Saudi Arabia's promise to raise production to a record high, oil started negative the week, two weeks before US sanctions could devour Iran's supplies. 973, but instead increased production to offset supply shortages in other countries. Falih also said Saudi Arabia would soon increase production to 11 million barrels per day (bpd) from the current 10.7 million. He added that Riyadh had capacity to increase production to 12 million barrels a day. Fund managers have reduced their combined position by a total of 187 million barrels over the past three weeks, having risen 196 million barrels over the past five weeks. The sell-off on global stock markets worried about oil growth and weighed on sentiment. 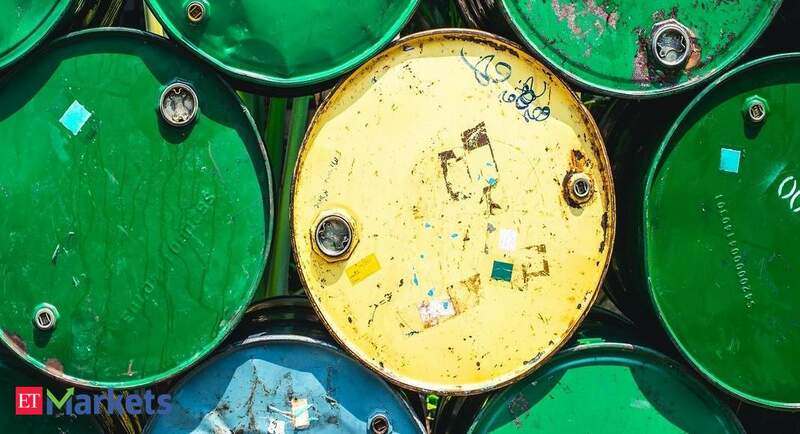 US commercial crude oil inventories rose 6.3 million barrels last week for the fifth consecutive week to 422.79 million barrels, the Energy Information Administration said. In addition, crude oil stocks in Cushing rose to 33 million barrels on Tuesday, an increase of nearly 1.8 million barrels from the previous week. Production remained unchanged at 10.9 million barrels per day (bpd), slightly below the record 11.2 million barrels a day reached in early October. Upside remains limited Saudi Arabia's Opec Governor Adeeb Al-Aama said the oil market could shift towards an oversupply situation in the fourth quarter, as evidenced by rising inventories in recent weeks. The domestic market tracked prices overseas and traded lower. The rupee has risen only marginally this week and has limited its upside potential. Looking ahead, prices may continue to be under pressure as traders and investors focus on a potential oversupply situation in the markets. However, markets may continue to focus on the Iran issue, and details of sanctions are expected on 4 November. Prices could therefore continue to consolidate for Brent near the barrel level of $ 75 per barrel. Technically, the MCX Crude is near its 21-week moving average on the weekly chart, which is priced at 4,896 Rs. This can serve as immediate support, facilitating the sharp decline over the last three weeks, indicating an upward move in the counter. On the daily chart, Crude has taken strong support of its Rising Trend Line lineup and is also near its 100-DMA, suggesting a bounce-back move in the counter. Due to the technical structure mentioned above we expect a bounceback in MCX Crude Oil in the upcoming sessions. Crude oil can be bought for around Rs 4,850-4,900 with a stop loss of Rs 4,730 and a target of Rs 5,200.
International gold prices rose this week as investors sought other asset classes following the global sell-off on the stock markets. World stocks fell to their lowest level in a year, under pressure from disappointing corporate earnings, Saudi Arabia's diplomatic isolation and a dispute over Italy's finances. The European Commission has decided to reject Italy's 2019 budget and has asked Rome to present a new document within three weeks. However, the upside potential of the US dollar limited the upside potential in gold. The weakness of the euro has helped the dollar this week. The euro fell to a two-month low this week after European Central Bank President Mario Draghi said the bank would continue its tightening policy, despite fears over the economic and political future of monetary union. The ECB has reiterated its bond purchase program will cost $ 2.6 trillion ($ 2.97 trillion) this year and interest rates could rise after the next summer. Political guidelines have been consistent since June, even though the economic outlook has darkened, while political turmoil in Italy surpasses the monetary bloc. Although Draghi said he was confident that the European Commission and Rome would come to a compromise on the Italian budgets, he failed to address concerns over the risk of contagion from rising borrowing costs. For data protection reasons, the SPDR Gold Trust rose 0.51% this week to 749.64 MT (747.88 MT in the previous week). In addition, data from Reuter showed that the gold ETF also had some inflows and stocks rose 0.16% from 1661,705 MT to 1663,702 MT this week. Domestic precious metal prices on futures remained tied in the range. Prices were originally overseas, but at the end of the week it was flat due to the strengthening of the domestic currency. However, spot gold prices have rallied this week's rally to a six-year record high of 32,625 rupees per 10 g, the highest level since November 29, 2012, when the precious metal closed at 32,940 rupees per 10 g. Higher global prices, a recovery in wedding and wedding time by local jewelers and a weaker rupee raised gold prices. Looking to the future, US GDP figures for the third quarter are due on Friday and a lower than expected value could trigger concerns about the dynamics of economic growth and possibly a change in the monetary policy tightening of the Fed. So this could support the gold prices. A cautious nod and optimistic view of the US economy by Fed Vice President Richard Clarida, US President Donald Trump's newest member of the Federal Reserve Board, has increased the likelihood of a December rate hike, however, slightly out of gold. Technically, MCX Gold trades in the Rising Channel line-up and faces upside resistance of its channel's upper band of Rs 32,400 on the weekly chart, indicating a downward pressure where a confirmation becomes clear when below Rs 31.850 holds level. In addition, the MACD of the daily momentum indicator has a negative crossover, indicating a negative breath in the counter. Due to the technical structure mentioned above, we expect a slight correction in MCX Gold in upcoming sessions, so that gold can be sold at a stop loss at 32,400 and a target of Rs 31,600 at Rs 32,000-32,100.